Express Catering were very proud to be involved with the 2012 London Olympic Games. We supplied many venues across London with a range of high quality meals from the security personnel to bus drivers to the last minute supply of many thousands of Army personnel. 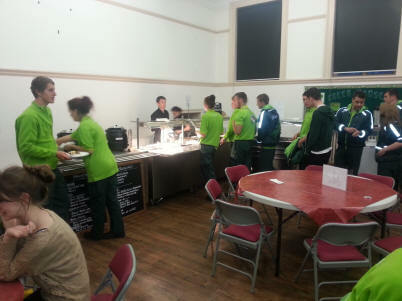 From our numerous Carvery units we served many thousands of Breakfasts, Roast meals , Curries , Lasagnes, Desserts and many other freshly cooked heart warming meals, to keep all the personnel in tip top condition. Also available were many vegetarian and Halal options to keep we hope, all of our customers happy. The legacy of the Olympic games for Express Catering has been not just a large selection of equipment from Carvery Units to Hot Cabinets, to many thousands of plates and cutlery, but also the experience gained of our well trained staff who are able to produce 24 hours a day, many tens of thousands of meals to an exacting standard time after time. The knowledge gained is invaluable in going forward to large events and deliver the customer quality food in the most extreme of environments under the highest pressure. Vital experience if this kind is the key to large Corporate , Festival and Event Catering solutions in the coming years for Express Catering and we very much look forward to the future. 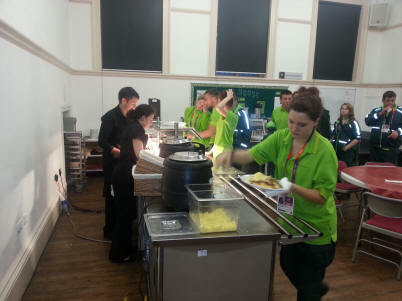 Express Catering were very excited to be on hand to assist with the smooth running of an extremely successful 2012 Games.